I tend to post the questions that can be applicable to a lot of people. I look for situations that other readers might find themselves in so I can offer advice that well be helpful to a large number of people. 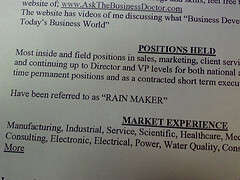 So, here’s my quick observation about lying on your resume. Obviously, it’s not the best idea in the world. I don’t think you’ll be able to find anybody that tells you lying on your resume is a good thing to do. So, I’m not going to repeat the obvious. What I am going to do is tell you why this is a bad idea. Based on my experience working with clients, there are two things that I have observed about resume falsehoods. There’s a Murphy’s law in play here. Whatever you lie about always has a way of coming to the surface. You can be 99.9% honest on your resume… but fudge in just one little area. If you do, I promise you, that is the one little thing that will trip you up.I can think of a very specific example. This is only one example, I know, but this is the kind of thing that happens all the time. One of my writers had a client who was in web programming and development. This was a couple of years ago when AJAX first burst on the scene and was becoming the rage. The client was versed and skilled in an array of languages and programs… but not AJAX. Well, it seems that after we did the resume for the client, he kept hearing in interviews AJAX, AJAX, AJAX. As I said, it was all the rage. So he took it upon himself to add that to his list of skills. Just that one little word: AJAX. I guess he figured he could learn it later if it came up.Well, I heard later it went like this: he got hired at a non-tech firm to be their programming guru. Brought him in to take over the place and bring them into the 21st century. A great gig. But of course, everything they wanted to do (revamp their calender system, their internal messaging system, etc.) they wanted it to be full of AJAXy goodness. Long story short, the guy figured he couldn’t learn everything overnight, and he had to fess up that he didn’t know much about AJAX. He told the company they’d have to hire a second guy, an AJAX specialist, to come in and help him with the projects. Of course, the company lost a lot of trust in our AJAX-deficient friend, and it turned out that within a few months the second guy, the guy brought in to help with the AJAX, got promoted to project lead ahead of him. I heard all this because the guy was back needing a resume again six months later because he was out of a job. And that leads me to my second observation about resume lies: they’re right there in black and white. You can’t talk your way out of them or deny them. It’s right there on paper. Our AJAX friend, for example, might have been able to plead confusion or misunderstanding if his thing had just come up in the interview or the conversation. But there was nothing he could say about the fact that right there, on his resume, he had knowingly claimed AJAX as one of his skill sets. He had represented that he could do a certain thing, solve a certain problem for the company. It was obviously a fabrication. And he couldn’t make it go away. So in summation, the things I’ve learned about resume lies are: the lies have a funny way of surfacing when you least expect… and the lies can’t be erased: they’re right there in black and white. Interesting story. I hope the person did get a job based on his skills and merits that are true. I’m sure that there are certain things you can fudge on your resume, as the 0.1% that you mentioned. For example, you can change the employment date to reflect that there wasn’t a gap in employment, if you got laid off from somewhere. You just have to make sure that the employment was quite a bit of time ago or if the company folded. This way, no one can retrace your steps. Rule No. 1: Never lie or exaggerate on your resume. Sometimes, our own interpretations of events could be seen as lies or exaggerations when the facts are not clear. When you’re assembling your resume and come across a point that may be arguable, sit back and think about it. Then, determine how someone else might see it, and look for words to describe that point that no one would argue with. Take any personal emotions out of it.